Aspartame is the artificial sweetener sold under the brand names of Equal and NutraSweet. It is used commonly in diet sodas because it tastes the most like sugar, or at least that is what the people selling it say. 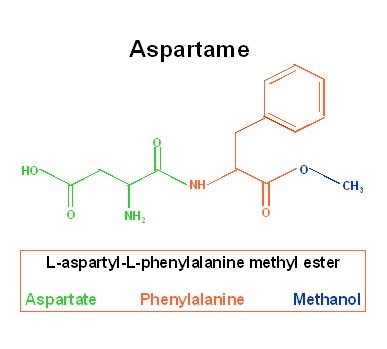 Despite all the hype about controversy, there is no aspartame controversy. All of the aspartame-industry-sponsored research consistently concludes aspartame is safe, while the independent studies overwhelmingly find side effects and problems. There is no gray area between the two sides. Every study connected to those who sell it says aspartame is safe while the independent studies find concerns. The controversy is really over whether research funded by special interest groups is valid. Mere mortals, like myself, might be tempted to ignore inconvenient facts if my livelihood or survival were threatened. When I was a teenager, I worked at a family restaurant famous for its generous portions of homemade pies and cheesecake. As a newbie waitress, I was surprised when customers would order dessert while insisting I bring artificial sweetener (saccharine, at that time) with their coffee. At the time, I did not understand why people were counting calories. I grew up in a rural area in the 70s. Everybody I knew guzzled whole milk, and in my family, ice cream was a food group; yet few people were obese. I remember our amazing high school girls’ basketball team. My friend, Nina, was the only one who did not look like she could bench press a Holstein. The girls were tall, fit and strong but there was not a calorie counter among them. Now, 30-something years later, the average 9-year-old understands calorie-counting, yet a near obsession level with the content of food only seems to be feeding the weight gain epidemic. Despite easy availability of reduced calorie and artificially sweetened food/beverages we are expanding by the minute so that 68 percent of Americans are now overweight. Caloric sweeteners like sugar and corn syrup certainly deserve some of the blame. Their consumption increased almost 40 percent between the 50s and 1999, when peak consumption levels reached a pancreas-busting 155 pounds per person per year — or 52 teaspoons of sugar a day. Or one of those rain-barrel-sized drinks they sell with your hexane-laced burger at the drive-through. But that is another story. Since 2000, sugar intake has reduced slightly due to a minor decrease in corn-syrup sweetened soda-slurping. But the diet drink industry is booming. The primary non-caloric sweetener used in diet sodas and teas is aspartame. Obviously, aspartame (introduced in 1974) and its buddies are not helping people lose weight because as a society, the more diet soda we consume, the heavier we seem to get. The reason for this phenomenon has been consistently found in independent research. That is, the taste for sweets, whether delivered by sugar or artificial sweeteners, enhances appetite. The only people who seem to think diet sodas help with weight loss are the manufacturers and some registered dietitians (RDs). A majority of RDs recommend artificial sweeteners to their clients. The American Dietetic Association has consistently supported the use of aspartame and in an “evidence-based study” attempted to bust lingering concerns about aspartame. The study reportedly concluded aspartame does not cause side effects, including weight gain. The dietitians claimed to be working independently even though some of the funding for the study came from the aspartame industry. And they want you to know the fact that the aspartame industry has generously supported the ADA through the years has no bearing on their recommendations or research. Pie, anyone?